Text: During the morning the usual tour of Pompeii, but in the afternoon, starting at half past four, we saw the first performance that has taken place for two thousand years in the ancient theatre: Euripides’ Alcestis, in Italian. A very fine and in parts (especially the first half) very harrowing production. The strangely obscure personality of Admetus perhaps defies (like that of Hamlet) the range of any actor. The play’s stupendous boldness of imagination and genius nevertheless remains as fresh as ever. There is a romantic, Shakespearian quality too in the structure of the work, with its compound of tragic and comic elements. And finally, as is the case with Shakespeare, the spectator is left with the feeling that the human soul is a riddle to which events, situations, and catastrophes occasionally supply clues without revealing its ultimate springs of inspiration. Comments: Harry Kessler (1868-1937) was an Anglo-German aristocrat and diplomat. His diaries are an exceptionally vivid and observant account of art and politics in Weimar Germany. 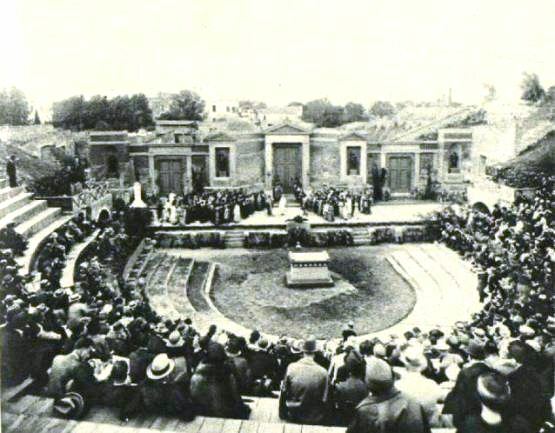 Euripides‘ fifth-century BC play Alcestis was performed in the Odeon theatre at Pompeii. The production was directed (and translated) by Ettore Romagnoli, with Letizia Celli playing Alcestis.